5" A/O Sanding Disc, U612 220-A Grit PSA 8 Hole, 100 pk. 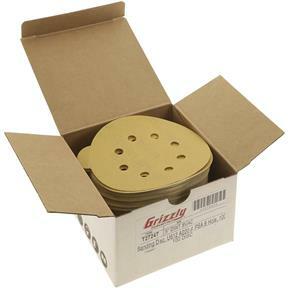 Grizzly T27247 - 5" A/O Sanding Disc, U612 220-A Grit PSA 8 Hole, 100 pk. These gold level aluminum oxide discs from PASCO have a faster rate of cut and longer life versus competitive "A" weight disc products - and for a better price to boot! The backings are resin bonded discs coated with zinc stearate to resist loading and are laminated to resist edge tears. Backs are Pressure Sensitive Adhesive (PSA) and include an 8 hole dust collection pattern. 220 grit, 100 discs per roll. I wanted to get 8 hole disc's but not the stick on. I have had to start using this for the job I am working on, but I don't know how long I can keep sticking them on the hook and loop pad. Is there any way I can get a return on the 48 disc's I have left and get the 8 hole hook and loop ?